The Apollo is quite simply the most gorgeous and unique real wood bluetooth speaker available. We couldn’t find a dual-driver speaker that paired flawless Bluetooth capability with beautiful aesthetics. So we made one. The exotic wood used with this portable speaker is as luxurious as any fine piece of art or furniture. Wood grain will vary slightly with each speaker, making yours unique from anyone else’s. After extensive development, the 45mm dual speakers provide enough sound to fill an entire home or office space. With up to 10 hours of battery life, the Apollo is sure to be the life of every party. USB charging is quick and simple. USB and 1/8″ aux cables included. For every product sold, LSTN helps provide hearing aids to a person in need through Starkey Hearing Foundation. We have helped over 20,000 people and looking forward to growing that number substantially with your continued support. The Apollo is quite simply the most gorgeous and unique real wood bluetooth speaker available. We couldn’t find a dual-driver speaker that paired flawless Bluetooth capability with beautiful aesthetics. So we made one. 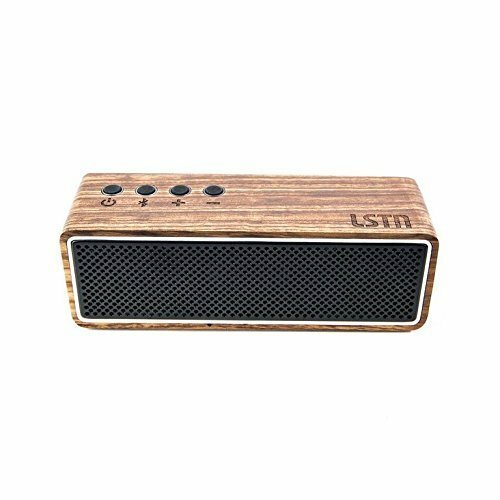 LSTN portable bluetooth speakers are handcrafted from real wood, and electro-acoustically tuned to produce amazing sound quality at any volume. The Apollo boast twin 45mm drivers for dual speaker power. LSTN real wood bluetooth speakers feature a built-in microphone for ease of use with answering and ending calls during playback. Expect stress free bluetooth connectivity with Bluetooth 3.0. This portable speaker connects with 2 easy steps so you can spend more time enjoying music, less time on your device. LSTN bluetooth speakers feature a 1/8″ aux input and usb input for charging. Satellite speakers come with a usb and 1/8″ aux cables for ease of use.